The Core Values Weeks are a yearly celebration of our Core Values. By taking time to focus on this we remind ourselves about the central tenets of our company that have built us into the team we are today all while having fun! Our Ohio team explored these values with a host of activities ranging from dressing up to yoga. Five days of five themes, everyone came to work dressed to impress. (They may have dressed up on their days off but we cannot confirm.) The themes were Twin, Crayon, Tropical, Tie-Dye, and Mismatch. Check out the slideshow below to see some examples of what they did. What’s quickly becoming a SupplyHouse tradition, Ohio practiced their flexibility again with a yoga session. Pairing nicely with yoga and our core values, guided meditation sessions helped our team relax and open their minds. Working through a difficult task together, teams of 5 had to unwrap a series of 5 prizes from a giant ball of saran wrap, passing it off in a relay race fashion, all while wearing work gloves! Teams were given a giant piece of vinyl to create a collection of symbols that represent one of their recent achievements, the company values, and where they saw the company going in the future. 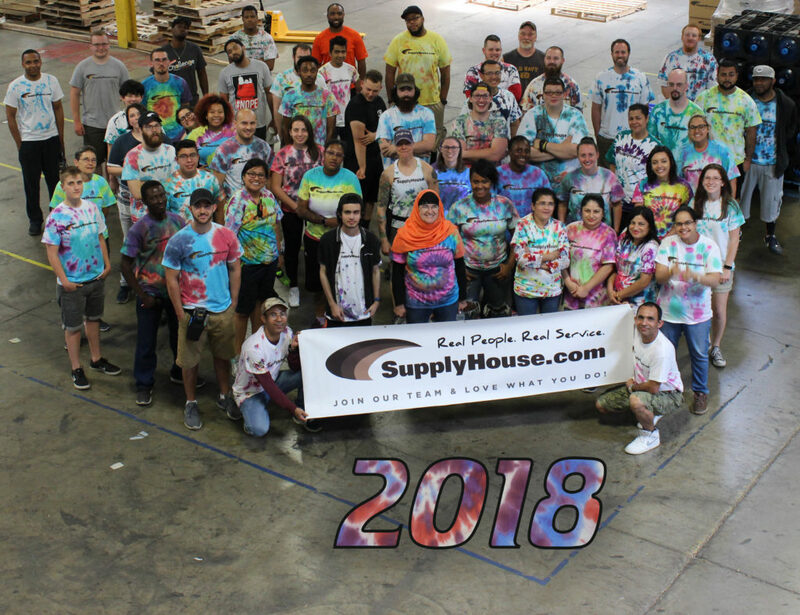 Our core values hold great importance to us at SupplyHouse.com. They helped build our company and continue to guide us as we grow. Taking the time to bring us all back to these values yearly keeps us on track with where we came from along with allowing us to have fun and come back to our work reinvigorated. Stop by SupplyHouse.com today and see how all this plays out to get you all your plumbing, heating, and HVAC products when you want them at the prices you want them for. Want to see more of our Core Values activities?